Sometimes, the best display vehicle is simply your own products displayed dramatically. It doesn’t take special shippers. It doesn’t take special packs. It doesn’t take anything more than creativity. 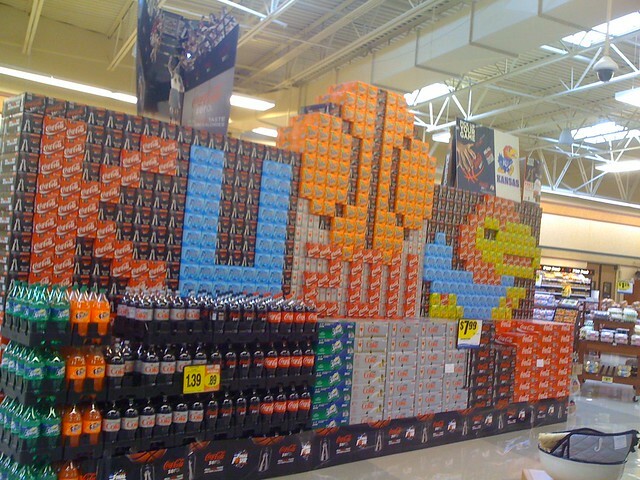 This Coke display for March Madness is such an example. I live in a college town that happens to house a champion team (Rock Chalk Jayhawk!). March Madness is always in full force here. This display took full advantage of that energy here. 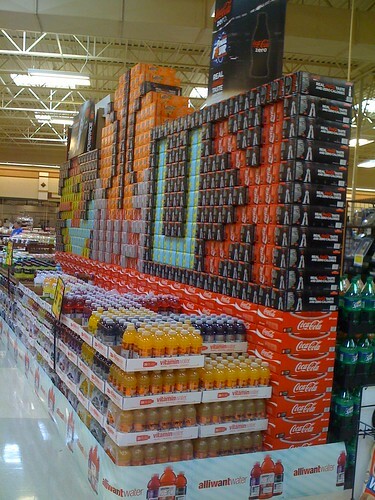 This impressive display took up a large footprint within the store, and featured a variety of Coke brands. The front and the back of the display contain shoppable stacks of products. While the back of the display makes less sense creatively (because the words are backward), it is no less impressive. In fact, I personally initially approached the display from behind, and had to take a moment to go around to the front to fully take in the effect of this wonderful display. What other creative examples of in-store displays have you seen around town?